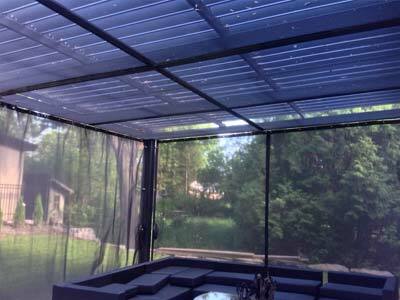 SunLouvre Pergolas is a new roof concept offering complete control over sunshine and rain. 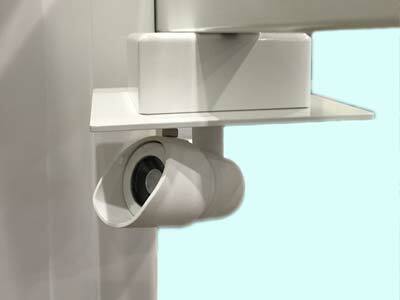 It is so versatile that it answers everyone’s needs: hotels, restaurants, spas or private homes. 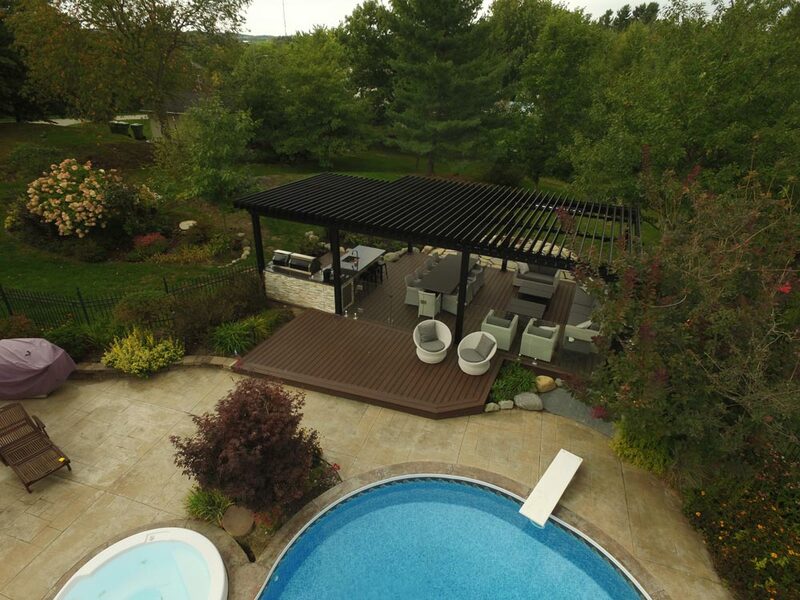 SunLouvre Pergolas is entirely built with high-quality aluminum. We offer customized products in order to maximize your space. 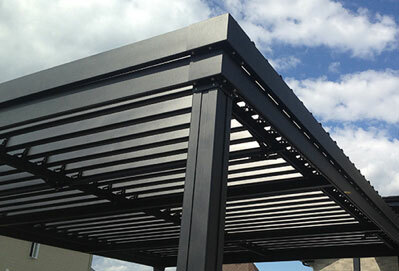 SunLouvre Pergolas will then be in perfect harmony with your environment. A simple mechanism is linked to the adjustable rafters, giving the opportunity to adjust the degree of desired protection. 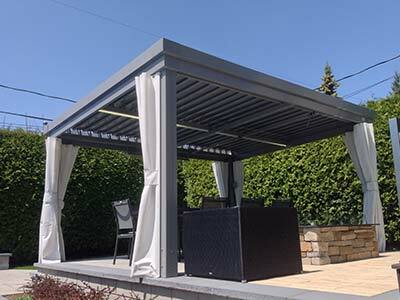 With their simple mechanism and their reliable and easy-to-manoeuver manual system, SunLouvre Pergolas transforms any outside area into an outdoor living space protected from sun and rain. Multiple applications of the SunLouvre product such as self-supporting, attached, vertical panel and on existing structure to better meet your needs. 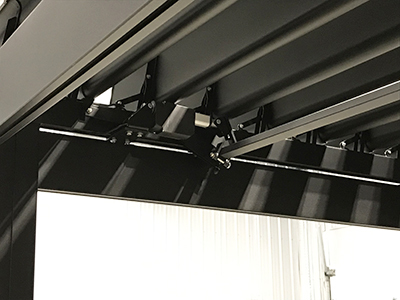 A simple mechanism is linked to the adjustable louvers, giving the opportunity to adjust the degree of desired protection. Attached to a house or a building, one can take advantage of the system in any conditions. In the summer, the closed position of the louvers protects from the sun by allowing areas of shade and more temperate weather. With the louvers opened in winter, they will let the sunshine bring light and warmth. The opening and closing of the louvers generate natural ventilation, expelling wind and heat up and out through the roof. Closed, the roof is waterproof. 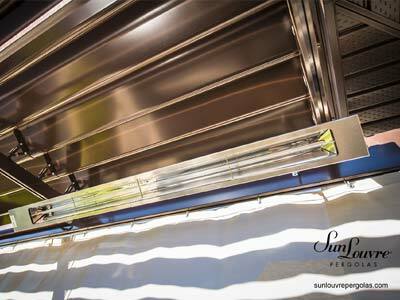 Equip your pergola with one or two patio heaters depending on the zone to cover. Add lighting to create an evening atmosphere. 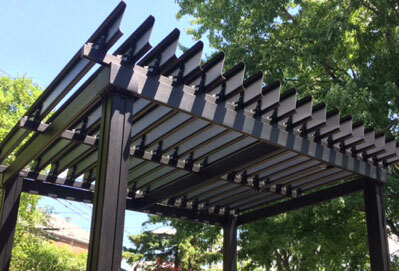 Equip your pergola with a motor that will activate the orientation of the louvres. Preserve your privacy by adding curtains. Install manual or motorized rolling solar blanks. Protect yourself from mosquitoes with mosquito nets.